Morning SpoilersIf there’s news about upcoming movies and television you’re not supposed to know, you’ll find it in here. Mark Ruffalo talks about Hulk’s new friendships in Avengers: Infinity War. Luke Skywalker wields an important artifact in a new The Last Jedi poster. The Flash is casting a few more comic book bad guys this season. Plus, a special guest star for The X-Files, Good Omens casts some Horsemen, and new Star Wars Rebels footage. Spoilers now! 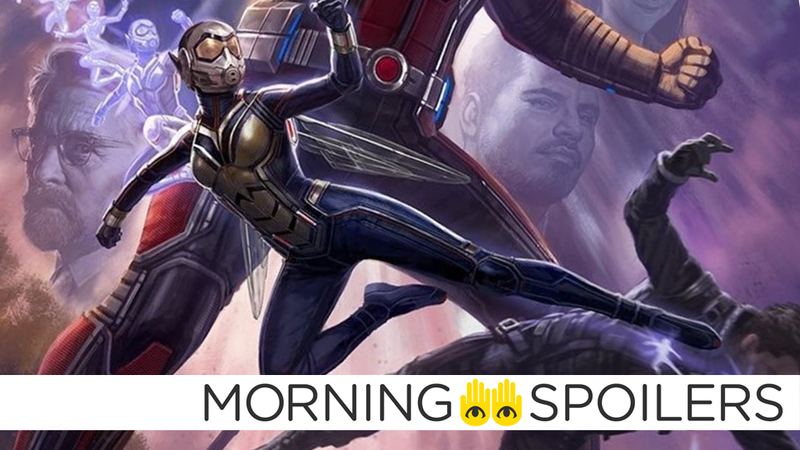 Just Jared has the first set pictures of Michelle Pfeiffer as Janet van Dyne, Marvel Comics’ first Wasp. The photos include Pfeiffer working with Michael Douglas without the facial hair (or white hair) of the modern-day Hank Pym, so presumably these are for flashback sequences in the film. The Tracking Board reports Adam Sztykiel, the creator of Undateable and screenwriter behind Alvin and the Chipmunks: The Road Chip, has been hired to write the screenplay. Speaking with USA Today, Mark Ruffalo confirmed The Hulk becomes fast friends with another irascible character suffering from trust issues: Rocket Raccoon. It’s a very funny relationship that the two of them have: First of all, it’s the biggest superhero and the smallest. Just keeping them in a frame together is a feat and hilarious in itself. Yeah, people ask me, ‘would you do another one,’ and for sure I’d do another one because it wouldn’t even feel like doing a fourth Thor film, it would just feel like doing the second Ragnarok film. Cuz it does feel like in a way, yeah there’s been this reinvention in an exciting way … So it’s exciting cuz it feels like, if Chris were to do this again it wouldn’t feel like ‘oh it’s the eighth time I’ve done Thor,’ no it will feel like the second or third time I’ve done this character. Same with Mark [Ruffalo]. Meanwhile, John Boyega shared a new behind-the-scenes picture of Finn recovering from his Force Awakens injuries. The motion posters come to a close with the fifth and final member of the Justice League, Batman. I’m sure there could possibly no one else in the next couple of weeks who could get a poster or anything, because surely they’re dead and won’t be in the movie, right? That Hashtag Show reports the show is currently looking for actors to play the Mr. Terrific villain, Brainstorm, and the dangerously radioactive Fallout. Shawn Levy confirmed to Collider that Matthew Modine’s nefarious Dr. Brenner is indeed alive, and will return in season three. We took a big swing for instance to open the show with a car chase in another city, then Episode 7 goes to another city for an entire episode. Whether or not people feel that episode was entirely successful, the Duffers want to take some swings, and they know that they’re not gonna please everybody. But that feeling of the world getting a bit bigger especially coupled with the fact that it now seems clear that Brenner is alive, Brenner is out there. I for one think that that one scene with Modine and Millie in Episode 7 is one of the juiciest scenes, and it kind of brought me back to how haunting Modine is in that Brenner role. So that’s a major unanswered question, and also we’ve now confirmed that Eleven isn’t the only one. There are other numbers. Finally, an omen leads Ezra and company to safe passage in a clip from next week’s episode, “Kindred”. Banner art by Jim Cooke.